Well, it’s been a while since I touched this tablet. I basically chucked it in a corner in disgust after it shat itself rather unceremoniously on the trip before we even got to the NSW/Victorian border. By “shat” itself, I mean corrupting files on the internal microSD card, intermittent device resets, display flickers, all the hallmarks of a dry joint. The seller on eBay that sold me the device have been completely unresponsive as to the problems, so looks like I kissed about $250 goodbye. Ahh well, such is life. They are still being sold on eBay, but buyer beware, they are cheap, and it’s pot luck whether yours is cheerful, or nasty like mine. If you want something reliable, look elsewhere. Having made this mistake, well, I’m looking to make lemonade from the lemon. First step, was to figure out what on earth I had. So out with the screwdriver. 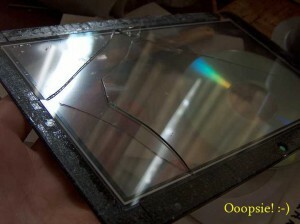 Why one should not try to detach the touch panel. Never mind I say… the unit was just about destined for the bin as it was. External USB HID devices work for what I’m after, but it’ll mean any touch-related fun is out unless I can pick up a replacement 4-wire panel. Element14 and RS have them at >$80, to which I say, bugger it, I’ll do without. Having pulled the unit apart, the main PCB is held to the back shell by a few screws, one thing is immediately apparent. 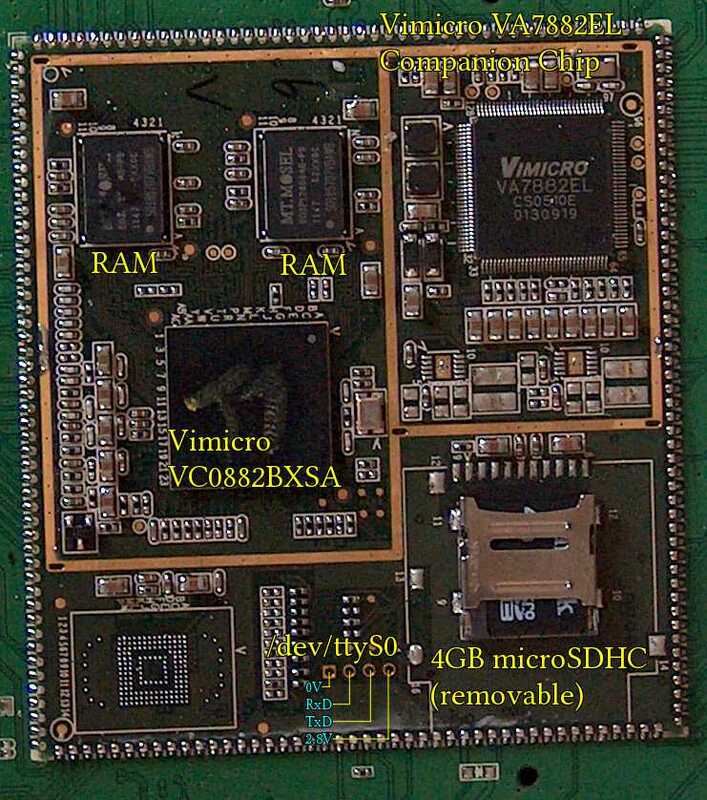 The whole device is based on what looks to be a fairly generic System-on-Module based around the Vimicro VC0882BCXA System-on-Chip, and the Vimicro VC7822EL companion chip. 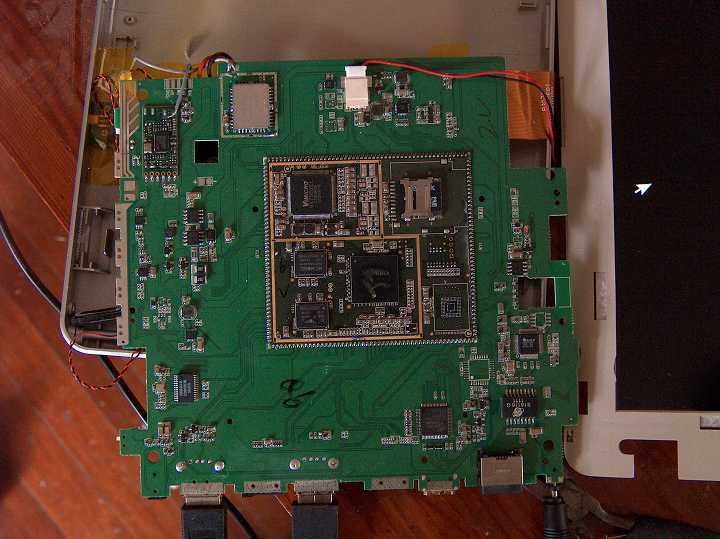 Top left is a Wifi module based on the Realtek RTL8111, and to the right, the GPS module (which hooks to one of the serial ports from what I recall). 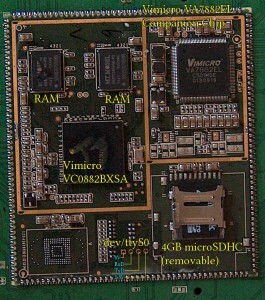 Down the bottom of the image are the USB ports. 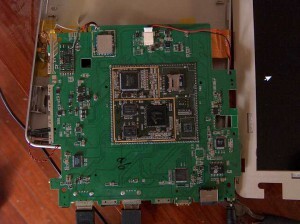 Near the HDMI socket is a Silicon Image SiI9022ACNU HDMI transmitter. I haven’t spotted the bad joints that were giving me grief. In fact, having gotten it out of the case, I find the top USB port (flakey from day one) seems to be behaving, and I’ve had no issues with it running with the case apart. Otherwise I’d be running a soldering iron over a few joints just to make sure everything was right. Next step? Well for now, I’ll put it back together (minus touchscreen) and put it aside. I’ll have a look at tacking a connector onto those serial pins, with a level shifter so I can interact with the serial console. Having gotten bootloader access, I should be able to debug the SD card cloning issue, then I can have a close gander at what the current u-boot and kernel are doing to tickle the hardware. End game? Well, Android isn’t much use without a touch screen, so I’ll be probably hacking together a Gentoo-based environment with some amateur radio related software. We shall see.